Sure the scale doesn't show it, but I feel great!!! 6 Months post-baby Harper #3. Which was in December but I am just now getting around to posting them! Here are the ole measurements! your girl is lovely, she has your smile! You are awesome, Lindsay! Lookin GREAT! You look fantastic!!! When i first read all of your posts at the beginning of your postpartum, I was amazed at how good you looked even then. I'm not sure if it was because you were super fit before or if it's a c-section thing, but after I had my kids, my belly area got dimply and loose. Yours was still tight and normal looking. My body is now the best it's ever looked due to a lot of exercise and watching what I eat and though my stomach is flat...I can't seem to get rid of that loose dimply skin. I'm scared because my husband and I are now just beginning to try and have a 3rd baby and I'm scared that my dimply loose skin will never go away and I'll never wear a swimsuit again or have confidence in my body. I would love it if you could suggest workouts I can do as soon as I get out of the hospital when I hopefully become pregnant again. Awww, you look fantastic! I've fully let myself go and lost all my results :( but it's my fault! Heyyy you look great! Congrats! I relate to what Chels posted about the stomach area being flat but still looking loose. Your stomach seems to look smooth even after giving birth. What advice can you offer us and is there any hope of us "smoothing" out the belly area with exercise? Some encouragement! 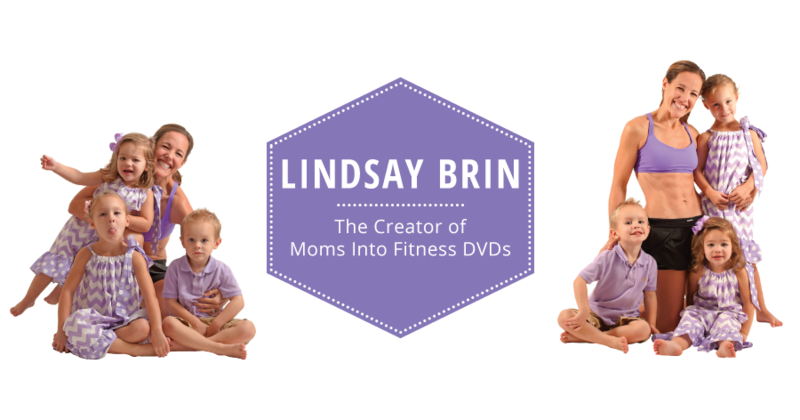 Lindsay had c-sections with all three of her kids, so she's had some similar experiences to you:). Good luck with getting your body back after baby - I know, it's hard sometimes. Sweet victory, right?!! You look incredible!! And very inspiring! Yes, yes, yes - there is hope! I do have good genes on my side (no stretch marks, which are very genetic). And of course going into the pregnancies with toning helped too. Toning, toning and more toning! That is what will help bring the belly in and create a smooth effect. Core training 3-4 days a week every week. Now with that said, some women's skin just doesn't bounce back. We lose elasticity as we get older. And the fascia - what I call the 5th muscle although its not really a muscls - is what pulls everything back. It's usually 90% normal 1 year after pregnancy. I was the director of 7 women's health clubs several years ago. And I would say this was the most common question! I would also say that 10 out of 300 women got their bellies back where they wanted them. So give it time and dedication to Core Training! Gosh I am just realizing I mistyped my above response! No idea how I typed 10 out of 300, it was 8 out of 10!!! respond to our questions and concerns!! Much appreciation. lindsay.. you are such a motivation for me! i was starting to lose weight with JILLIN MICHELS 30 DAY SHRED... but the belly wouldnt budge.. though i did lose weight around the waist.. but it was still protruding..2 yrs after having my baby... so i discovered i have diastasis recti. bummer! so knowing i cant do traidtional ab excercises.. i did rearch and found you! so which of your workouts would you reccommend to someone like me with a 3 finger seperation ... i need something with weight loss too. not just toning. Ooohh you are perfect for our Pretty Fierce series, although I lean towards the Lean Out Program for you. BUT Pretty Fierce Weight Loss is made for Diastasis Recti, Lean Out has too many planks and other positions not good for DR. How close would you say you are to getting that separation to 2 fingers? Try the free trial of PF Weight Loss and see what you think. There is also a free trial for Lean Out, but you would need to be cautious with yoru DR and not perform the Core Workout or plank position exercises. Dear Lindsay! You are such an inspiration! Thank you! I am a first time mom of a 2 month old baby girl, and I delivered naturally (28 hours of labor with NO DRUGS to be exact :) ) . I used your prenatal DVDs while I was pregnant, bought your book, and only gained 35lbs with my pregnancy but I am only down about 10 lbs right now. 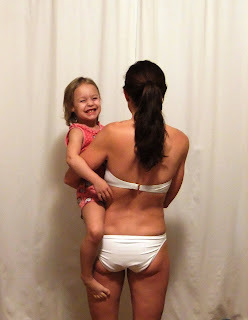 This blog post is it is a great reminder that getting your body back takes time - and that has been the biggest shock for me as a first time Mom. Even though you read about it taking time, it is different once you experience it. The first 6 weeks of NOT being able to work out was torture for me, seeing my sagging belly and not being able to do much about it was hard- though I did also follow your tips for that as well, but it was still so minimal. Now I am back in the saddle the past two weeks, and I love reading your blog because it inspires me to keep going. Do you have any tips for new moms on body image, and the first time after baby body shock? I feel like for Moms who have lost the baby weight and gotten back in shape after the first baby have an easier time the second time just because they KNOW they can do it. That is what I am struggling with - the fear that I won't get my body back. Mrs. Wear, I remember that feeling really well! And those first several weeks are the hardest. You are only 2 months out (congrats by the way, and you rock on al natural!) so your body just got back to "normal" on the inside. Months 3 and 4 start providing more noticaeble results and that should help you mentally. Just concentrate on the baby, the body will come. And you are so proactive, I know you will have no problem. What is the time frame when it comes to losing baby weight mainly the thighs and stomach. I hear it took 9 month to put on so give yourself 9 months to take it off. That's all fine and dandy but my baby is 10 MONTHS and I still do not fit in all of my clothes. I have been working out since the day the dr. gave me the ok. I eat so much healthier then I ever have before to the poin that my food has become boring!! Blood work was checked to see if maybe I have thyroid issues..that came back fine..just low vitamin D. As you can see Im doing it all! What can I do to get rid of this belly and chubby thighs once and for all?? Thank you!! Email us by clicking the envelope icon at the top of the blog. Send me your exact workouts, whether you are breastfeeding, weight, height, age and a 3 day food journal. We will get you figured out, promise! I am glad you find it helpful! I am totally with you...nobody wants to jump on the bandwagon of mom killing it for a few weeks...slow and steady is best!